Many of you may have read my recent article for the Outdoor Sports Guide Magazine talking about the The Big Five – Utah’s Must-Run Marathons. 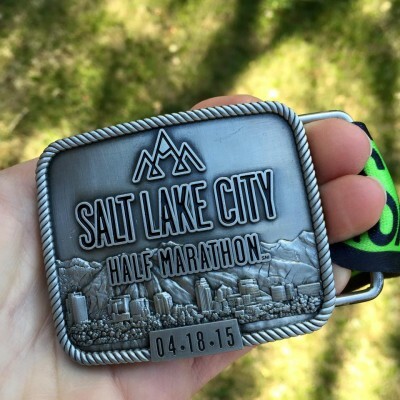 The first race I mentioned was the Salt Lake City Marathon. 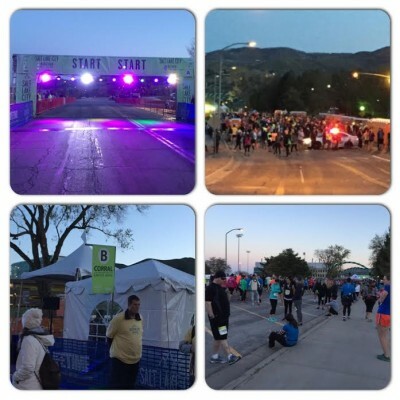 There are many reasons I choose to include this event and over the weekend I had the privilege of participating in the Salt Lake City Half Marathon. I had a great experience at this well-organized event! The expo was packed with great booths and staffed well; so the lines flowed easily at packet pick-up the day before the event. It was fun to bump into friends there and browse the booths. The next morning I got an early start and was thrilled to see perfect temperatures for the event. Many people parked at the finish and racers bib numbers gave them a free ride on TRAX to the start. The starting line was situated next to the University of Utah outdoor track. It was a fun and festive environment with music, laughter, nervous excitement and lots of people. I believe there were nearly 6,500 people participating in the 5 different event options. The Marathon and Half Marathon participants where to start together in waves. Each runner was assigned a corral based on estimated finish time starting with A at the line and continuing back through the alphabet. After dropping off my tagged bag I headed to my assigned corral which was B and started with the gun. Other corrals were roped off and would be started in 30 second waves. It was great to see many familiar faces at the starting line and chat for a few minutes before we began. I especially enjoyed talking to a former teammate I ran with in college. The race started with perfect tank top running weather at 45°. Soon the race was underway. The 1st mile included a fairly steep hill which separated a lot of the pack. As usual the first mile pace was fairly fast as everyone is burning up all the extra energy they have at the beginning of a race and settling into a pace. I hit the one mile mark with a 7:07 split. The next few miles were like a run down memory lane for me. I am originally from Colorado and was recruited to run long distance for the University of Utah on athletic scholarship. My freshman year in college we used to run the same roads as I was experiencing at this time in the race on 1100 East. It was a thrill to run down Memory Grove and truly did bring back a lot of great memories for me. The flow of people was steady and I felt like I was out on a run with a bunch of friends with all the “hello’s,”“How are you doing?” and “Hey, it’s Blonde Runner.” The great thing about participating in large events like this is you don’t have to worry about taking a wrong turn since it’s well marked and having people around keeps you motivated and it is always fun to chat a little. Soon we found ourselves running on some of the main streets in downtown Salt Lake. There were many crowds of people cheering along the way and my ears especially peaked up when I heard familiar voices cheering “Go Blonde Runner!” and fun to see familiar faces at aid stations. The aid stations were mainly stocked with water and Powerade and volunteers were well-training and friendly. My legs felt good and strong and my mantra for this race was to stay relaxed, be patient, run efficient and smooth and be strong. I took each mile in stride and enjoyed the experience. This was the first year I had participated in this event and it was fun to be part of such an iconic and highly anticipated event. The route toured many familiar roads and I especially love closed courses like this when we don’t have to worry about traffic. There were many mild incline and declines to keep it interesting but overall the course was downhill. Just before mile eight there was a significant and challenging hill right after an aide station, and about another mile down the marathoners peeled off to the left and the half marathoners stayed straight. It was great to see now where I was at in the race and set my sights on passing some of the people in front of me. Soon I reached mile 10 and was reenergized knowing I only had a 5K to go. Having done hundreds of 5K’s in my life I continued to repeat my mantra in my mind and maintain good form. As I rounded the corner of the final turn and could see the finish arch in the distance I continued to push all the way through the finish and was awarded my finish medal. It was an awesome belt buckle – I love practical things. I completed the event in a time of 1:36:40 (7:23 average). I was pleased with my efforts considering I had just had knee surgery 12 weeks ago as a result of being hit by a truck on my bicycle last Fall. The finish area is always so much fun with the music and people cheering. They had an assortment of food and I loved that the finish area was only for runners. 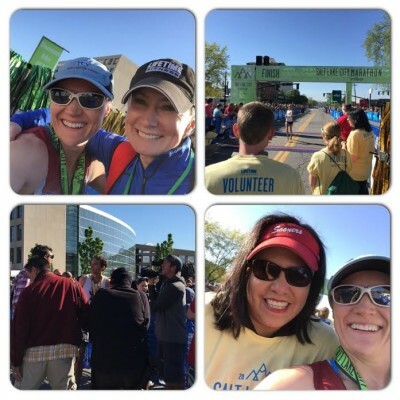 I mingled with many friends and made some new ones as I waited for many of athletes to finish. I was delighted to find out later that I had placed 2nd in my division and 3rd Overall Masters at the 2015 Utah State Half Marathon Championships. It was a great event and I won’t hesitate to participate again. 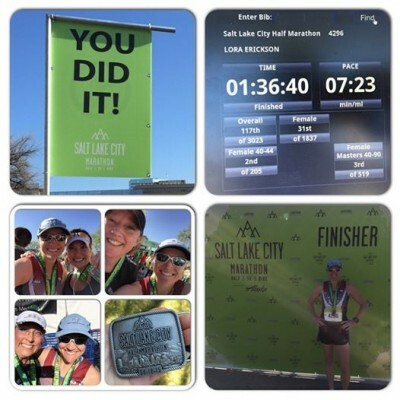 If you need help training for your next event (running or triathlon) please contact me at Coach Lora Erickson at theblonderunner@gmail.com I would love to help you reach your goals.